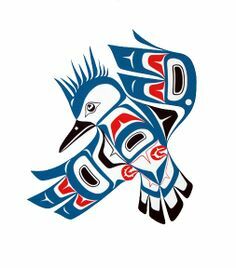 First Nations of the Northwest Coast believe that the Kingfisher is the promise of abundance, of new warmth, prosperity and love that is about to unfold within your life. The Kingfisher has long been recognized for his speed and agility as well as his keen hunting skills. 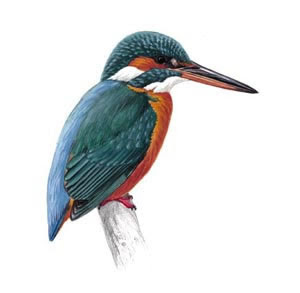 Kingfishers are a group of small to medium sized brightly colored birds with large heads, long, sharp, pointed bills, short legs, and stubby tails. Kingfisher indicates a period of increased mental and spiritual activity. He will show how to manifest your destiny by listening to your intuition. Since psychic perceptions are increasing, he will instruct how to remain grounded in the earth and be comfortable in doing so. Take time for yourself in quite solitude connecting to Mother Earth. Grounding and centering is needed. Although he may be shy, the Kingfisher knows how to strike with determination. How are you using your dagger-like bill? He will teach the art of timing and when to act. Kingfisher demonstrates excellent visionary skills and will teach how track your prey. He directs attention to feelings and what is unseen. Watch carefully what is going around you. Listen to your dreams and visions. He shows it is time for forward movement, letting go, forgiving the past. Kingfisher’s medicine guides in seeing into the depths of emotions and into the unsubconscious. His lesson goes much deeper than what is on the surface. He aids communication and reaching higher spiritual energies along with the ability to express ideas with coherence. This is also an opportunity to balance masculine and feminine energies.